Until 4 pm today, voting is ongoing for the Democratic candidate to challenge incumbent Eugene Delgaudio for Sterling district supervisor in November. 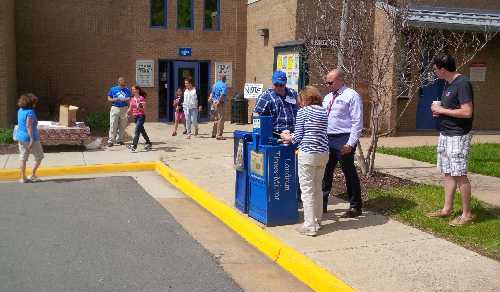 Voting is at the Community Center/Library near the DMV. Candidate Tony Barney says the turnout so far has been impressive, and that there was a line out the door for quite a while after voting began. 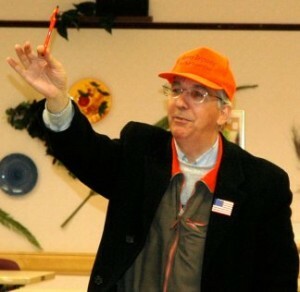 Several people asked me about the LCRC convention and some were under the impression Eugene Delgaudio was being primaried. They were surprised he was still the GOP candidate, and more surprised he was uncontested. I explained a little about the strength and survivor instinct and the reliability and, yes, the mystique. Filing for all other Loudoun races, except that of my high school classmate’s, Randy Minchew’s, is closed. With the exception of his district and Sterling, the general races now begin. 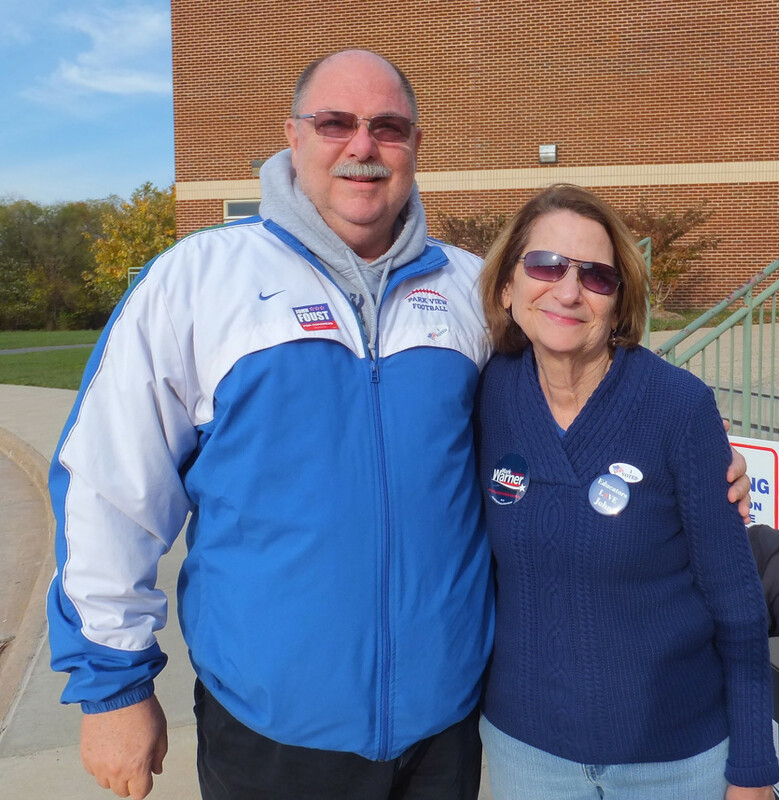 Tony and Marlene Barney on election day, November 4, at Rolling Ridge precinct. 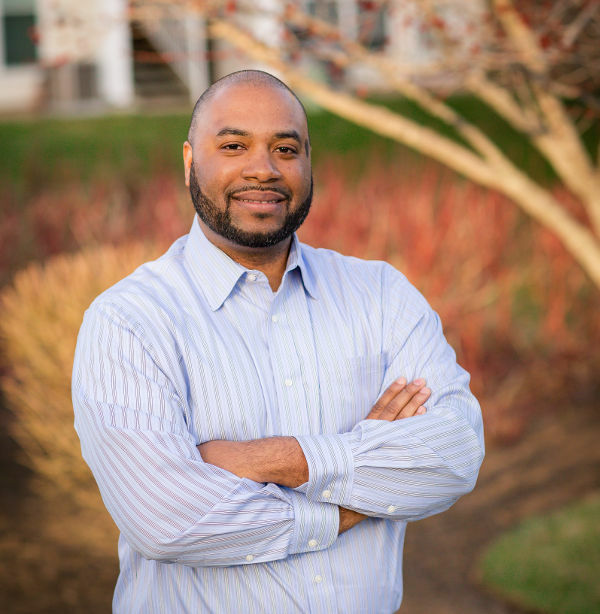 Tony wants to challenge incumbent Eugene Delgaudio for the Sterling district seat on the Loudoun County Board of Supervisors. Sterling wants to grow and Loudoun wants to grow and the only way we can grow is to work together on real issues, and be open and listen to people, and be able to compromise and negotiate, and invest in the future, and always ask the question – what is our return if we do invest? 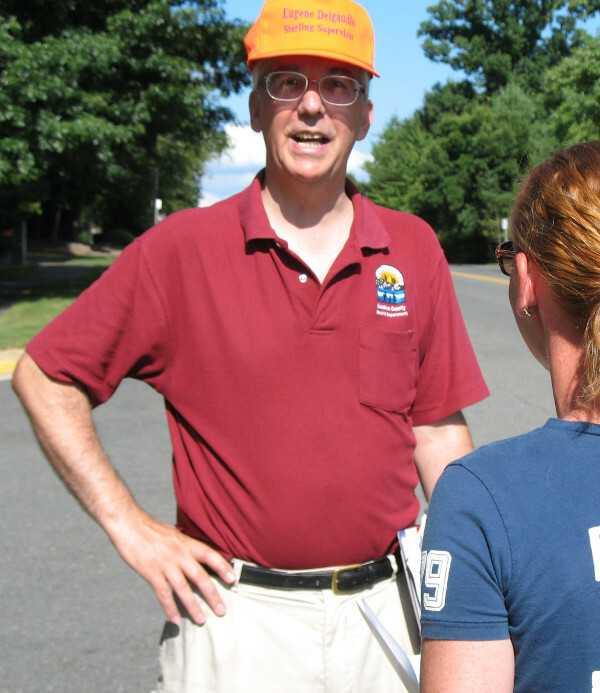 Barney first needs to secure the Democratic nomination to challenge incumbent Republican Delgaudio in the November, 2015 elections for the Sterling district seat on the Loudoun County Board of Supervisors (BOS). If he can win the nomination, then defeat Delgaudio, after serving a single four-year term on the BOS, Barney would pass the baton to a Democratic – or Republican – successor, having “cleared” the office. In what is certain to be one of the most closely-watched campaigns in the coming year – and not just locally – Delgaudio once again will build on his own long history in the Sterling community while fending off slings and arrows from those who disagree both with his work as supervisor and his day job as an advocate on controversial political issues. Democrats will try to follow up a “recall” movement aimed at forcing Delgaudio from office mid-term, led by his failed previous Democrat opponents, which fizzled when dismissed by a judge. (As Barney notes in the conversation below, his personal opinion is: The way to remove Delgaudio from office is through the ballot box). Barney’s task will not be easy. Delgaudio first won election to the Sterling supervisor seat in 1998 – making him one of the longest-serving supervisors in county history – and has beaten back fierce challenges in each subsequent contest. 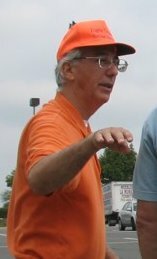 In the Democrat wave election of 2007, following a Republican primary challenge and under vigorous attack by Democrats and other interest groups, Delgaudio was one of only two Republicans on the board to prevail in the general election, defeating longtime Sterling resident Jeanne West by a little more than 200 votes. Then in 2011, Delgaudio increased his margin of victory and beat the combined vote total of two challengers: a spirited Independent and the Democrat Al Nevarez. 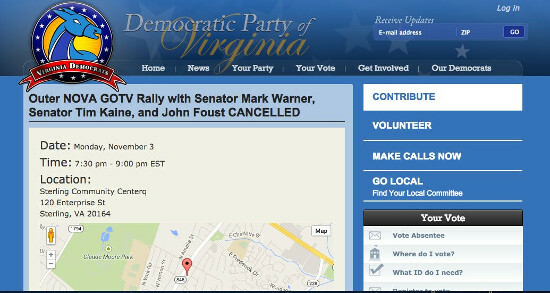 The Democrats made an unforced error in putting up the weak candidate: a recent transplant to Sterling, “Occupy” cheerleader, Daily Kos contributor, and self-professed union activist who claimed the U.S. middle class is actually funded by the federal government. For more background on Delgaudio, click here for a round up of stories at Firewall NOVA, and click here for an in-depth interview from the 2011 campaign. Firewall NOVA met with Barney on election day, November 4, while Barney and his better half – Marlene – were working at the Rolling Ridge precinct. Your humble correspondent was handing out sample ballots on behalf of the Republican Party, and the Barneys for the Democrats. Having worked across from Tony Barney at this same precinct for years, your correspondent can report that, for a Democrat, Barney is a congenial fellow – easy going and plain spoken in demeanor, who seems moderate on the ideological scale. Through the long election days Barney can be generous in sharing suggestions and observations about conservative policies and Republican Party tactics, all of which, your correspondent can assure you, are received politely and with fathomless gratitude. In your opinion, what is the number one issue for the 2015 election? In case you were worried the unpleasantness of the past year might have hampered Eugene Delgaudio’s exuberant style, you can put that concern to rest. 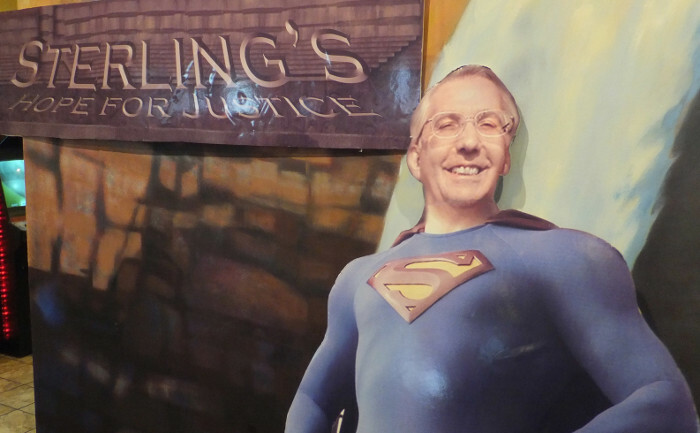 The Sterling district supervisor was back in vigorous form at his campaign kickoff and fundraiser last weekend at Joe’s Pizza in Sterling, with about 80 attendees over the course of the two-plus hour event. Looking primed, rested and jovial, he seemed at full speed on the campaign trail already, and said he is extremely encouraged by what he’s hearing from constituents. At least from Delgaudio’s side, the 2015 election season promises to be a barnburner. 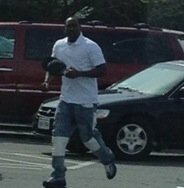 Loudoun County, VA- The Loudoun County Sheriff’s Office is seeking the public’s assistance to help identify a suspect who injured two deputies as he attempted to flee from the scene of a larceny at the Costco in Sterling, Virginia. Loudoun County Sheriff’s Deputies responded to the Coscto on Price Cascades Plaza around 3:45PM on Saturday for a report of a larceny in progress. A male suspect was attempting to take televisions from the store. Deputies confronted the man and attempted to stop him from fleeing the area. The suspect entered his vehicle, closed the driver’s side door on one deputy’s hand. A second deputy attempted to grab the suspect through his window. The suspect drove away, dragging the deputy for approximately 60 feet and striking a Loudoun County Sheriff’s Office patrol car. Both deputies were taken to a local hospital and have since been released. The Loudoun County Sheriff’s Office has released still photos of the suspect and the suspect vehicle. The suspect was driving a 2004-2006 model Acura with New York tags. If you have any information regarding the possible identity or whereabouts of this suspect, you are asked to call Detective W. Promisel of the Loudoun County Sheriff’s Office at 703-777-0475. Callers wishing to remain anonymous are asked to call Loudoun Crime Solvers at 703-777-1021. If the information leads to an arrest and indictment, the caller could be eligible for a cash reward of up to $1000. Longtime political activist and chief executive of a conservative non-profit organization, Eugene Delgaudio is also one of the longest-tenured supervisors in county history. He seems, from one perspective, a surprising fixture on the board of supervisors, considering Loudoun voters’ tendency to flip it’s political polarity every four years. If the Republican-Democrat-Republican cycle of the past signifies anything, it would seem to be a vacillation between extremes, the equilibrium of a spinning gyre. The board’s other survivor is Scott York, also of Sterling, who is exactly the type of middle-of-the-road, self-reinventing public figure one might expect to remain standing amid political earthquakes. And alongside York, there is Delgaudio the lighting rod, unlikeliest of political constants. But will the cycle of waxing and withering now, finally, claim the man in the orange hat?